Every package in Ubuntu has a set required packages, a set of recommended packages and a set of suggested packages. The required packages are dependencies, so their installation is mandatory, but the installation of other two sets can be skipped. The recommended and suggested packages are not essential to the functioning of the package being installed. Disabling the installation of recommendations allows to save a lot of disk space. Need to get 91.6 MB of archives. After this operation, 174 MB of additional disk space will be used. Need to get 2,360 kB of archives. After this operation, 3,617 kB of additional disk space will be used. This is a great example of the amount of disk space that can be saved: 4MB against 174MB. 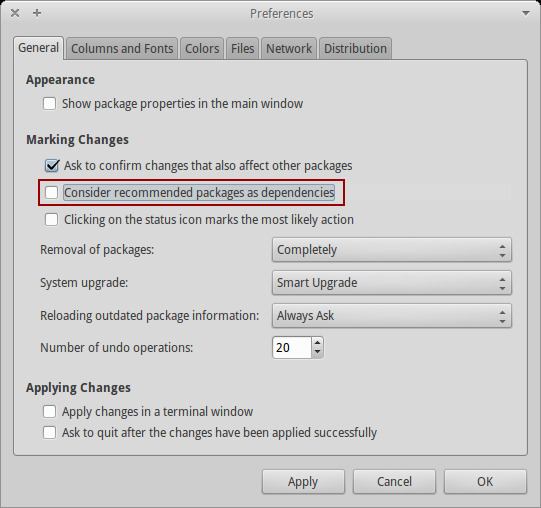 Alternatively, Synaptic (available at Applications Menu > Settings > Synaptic Package Manager) can be used to disable automatic installation of recommend packages. Just access Settings > Preferences > General and uncheck "Consider recommended packages as dependencies". Graphically, you can apply the option permanently in the preferences of Synaptic. Thank you for your kind words and also for the suggestion. The post was updated to include the graphical alternative.